Dennou Coli Part 2 DVD Review Wonderfully imaginative and endlessly compelling, Dennou Coil is a brooding meditation on the relationship between humans and technology. God bless Siren Visual, bless their little cotton socks. If it wasn’t for them and Madman we wouldn’t get any decent anime in this country, and would be forced to resort to various unsatisfactory acts such as viewing titles exclusively online or ordering from overseas at vastly inflated costs, with no guarantee that picture quality, subtitles and so on will pass muster. I don’t know about you, but I don’t want to live in a world like that. Dennou Coil was created, written and directed by Mitsuo Iso, who has worked on some of the most highly-regarded animated projects of the past two decades, including Ghost in the Shell, Hayao Miyazaki’s Porco Rosso and the near-flawless Perfect Blue, which incidentally served as a primary influence on Darren Aronofsky’s latest opus Black Swan. He brings a deft touch of perfectionism to proceedings (according to Animage magazine the series was reportedly in development for over a decade) and the end result was widely acclaimed both in its native Japan and abroad. Wonderfully imaginative and endlessly compelling, Dennou Coil is a brooding meditation on the relationship between humans and technology. As the history of the Dennou system is explored and the sinister motives of its creators revealed it becomes a little dark in places, especially considering the ages of its protagonists, but it’s still an enjoyable and addictive animated treat of suitably epic proportions. In addition to the 13 episodes which comprise the second instalment of Dennou Coil, the 3-disc set also contains a veritable cornucopia of bonus material. 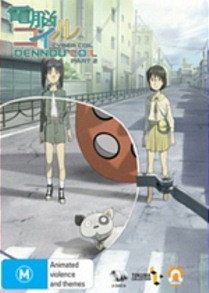 Included here are two full-length bonus episodes (Independent Research and Dennou Coil General Review); Preview and Press Conference Screening Q&A sessions with several of Dennou Coil’s producers and voice actors; a series of nine incisive interviews with essentially the entire vocal cast (averaging around 20 minutes each); six minutes worth of TV spots; three Behind the Scenes Production Shorts on the Voice Recording, Soundtrack and Editing processes; as well as textless opening and closing sequences.